This afternoon, U.S. vice president Joe Biden met with video game representatives to talk about the Sandy Hook shooting. Here's a picture of the meeting in action. Hopefully it went well. You can also make out Robert Altman, CEO of ZeniMax Media (the company that owns publisher Bethesda, among others) and ex-Epic Games president Mike Capps—both seated in front of Biden. One odd detail from this meeting: Pat Vance, head of the games rating board (the ESRB), seems to have brought a copy of Blastman III with her. What's Blastman III? Either it's the most obscure gaming gift ever presented to a Vice President or... we're not sure. Maybe it's a made-up game that the ESRB used for demonstration purposes. We've asked the ESRB to clarify. Update: That's exactly what it is. "Yes, 'Blastman' is a prop we created for the purpose of illustrating how rating information is displayed on game packages," an ESRB spokesperson tells us. With members of the Cabinet and the gaming industry seated around him, the Vice President invited the press in, mostly to fill them in on his hopes for the meetings his post-Sandy Hook task force has been having. He said little about video games, instead referring to a range of issues, including interest in various checks on guns. 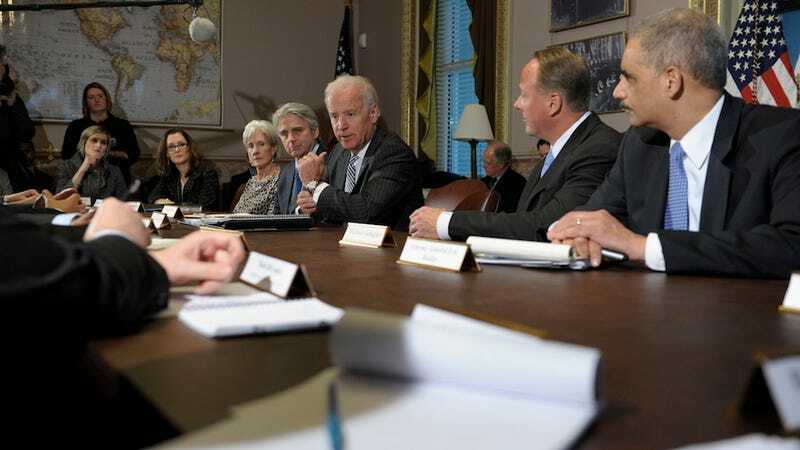 Gesturing to gaming industry leaders, the Attorney General and other Cabinet members, Biden did try to explain why he was meeting with entertainment executives and not just the National Rifle Association and mental health experts. "We're anxious to see if there's anything you can suggest to us that you think would help, as this President said, diminish the possibility of … if we save even one kid's life," he said before hitting a tangent. Later, he added, "There's no measure that I'm aware of to be able to determine whether or not there's a coarsening of our culture in a way that is not healthy. I don't know the answer to that question. And I'm not sure what impact it would have or it wouldn't have on the kind of events we're looking at." Many fans of video games don't believe that video games have a part of Biden's talks. The science on whether video games can trigger aggression is mixed, and there have been no scientific studies that connect video games to violence. Whether games coarsen culture or not, gamers would doubt that games cause violence. Biden conceded that. "We don't even know whether some of things people think impact on this actually impact on this or not," he said, turning to John Riccitiello, the head of EA. "And so I want you to know that you've not been, quote, singled out for help, but we've asked a whole lot of people."